Hyundai and LG, South Korean brand giants are currently studying Sri Lanka for the feasibility of commencing manufacturing operations in the country. Also, other Korean firms too are keen on a variety of projects in Sri Lanka, said Korean Ambassador Jongmoon Choi at a meeting with the Minister of Industry and Commerce, Rishad Bathiudeen last week. Hyundai is mainly looking at ship-building and repairs while other Korean firms including LG are looking at electronics. These companies are planning to send a fact-finding trade delegation to Sri Lanka in the near future, Jongmoon Choi said. The 21st FACETS Sri Lanka 2011 international gem and jewellery exhibition saw strong sales to foreign buyers exceeding $ 10 m but the overall total could be far higher. More than 7,300 visitors attended the show of which more than 1,300 being foreign visitors. The top-most preference for foreign buyers was the Ceylon Blue Sapphire and factors needed to make Sri Lanka a blue sapphire hub are falling into place. 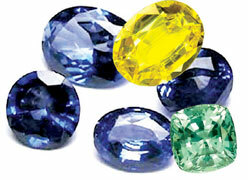 The exhibition was organised by the Sri Lanka Gem and Jewellery Association (SLGJA). Softlogic Information Technologies (Pvt) Ltd introduced a range of mobile products to provide people the best on-the-go entertainment, social connection, and navigation experience. The company appointed Dialog Axiata as the official mobile service provider further adding value to the tablet and smartphone market in Sri Lanka. The Dell Streak is a compact and powerful companion for individuals and business ventures who want to expand their ability to access their digital lives on-the-go, and realise tomorrow's technology in the present. Trade and agricultural policies are at the core of development issues, said Secretary-General of UNCTAD Dr. Supachai Panitchpakdi and Director-General of the World Trade Organization (WTO), Pascal Lamy addressing the annual Trade and Development Board, UNCTAD's governing body. Dr. Supachai stressed the need to look at the financial crisis as a lever for engaging member States and to align domestic policies so that developing countries can log into the international trading system. He said that in 2010 there had been a robust recovery fuelled by dynamic growth in emerging economies, but now the international community was facing a growth crisis. 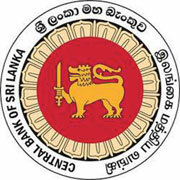 Domestic economic activity is expanding at a commendable pace, supported by improved external and domestic demand, said the Central Bank of Sri Lanka. Sri Lanka's gross domestic product is estimated to have grown by around 8 percent in the first half of 2011, with industry and service sectors recording impressive growth. The contribution of the agriculture sector has also been positive in the second quarter, following its contraction in the first quarter. The favourable outlook for domestic economic activity augurs well for domestic prices, going forward. Although commodity prices have continued to remain elevated in international markets, improved domestic supply conditions and stability of the Sri Lanka rupee have helped contain domestic inflation. Singapore Airlines Cargo added Jakarta to its freighter network and increased its weekly frequencies to Auckland, Shanghai, Sydney and Xiamen. The new once-weekly Boeing 747-400 freighter service to Jakarta's Soekarno-Hatta International Airport, commenced on September 5, 2011. This new freighter service will be increased to twice weekly from Northern Winter 2011. The freighter service to Jakarta complements the belly-hold space available on Singapore Airlines' 49 weekly passenger flights between Singapore and Jakarta. From September 15, this will be increased to 56 flights per week. Double Asia Miles on Cathay Pacific flights to Bangkok, Singapore and Hong Kong Cathay Pacific Airways gives travellers an opportunity to double their Asia Miles on flights from Colombo to Bangkok, Singapore or Hong Kong this month. Travellers can earn double Asia Miles when they register and fly on a round-trip (Economy Class) between Colombo and Bangkok, Singapore or Hong Kong on Cathay Pacific. Tickets can be booked until September 30 and travel needs to be completed on or before September 30. Samsung, unveiled its full range of refrigerators.Softlogic, the authorised distributor for Samsung in the market will have the full range of refrigerators on display at its Islandwide showroom network. Samsung refrigerators are feature packed, with advanced technology. It saves electricity and performs better than ever with Anti Frost, Moisture Control Systems and with Twin Cooling Systems. The Airline Academy held its awards ceremony at the Grand Oriental Hotel recently. Here a participant receives an award from the chief guest, Manager, Air Asia, Ranjeeva Senanayake. 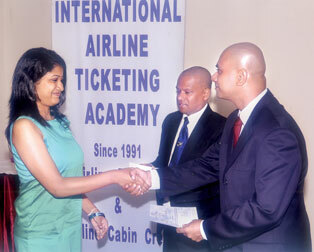 International Travel Consultant, Airline professional instructor and course co-ordinator, Deepal Perera looks on. 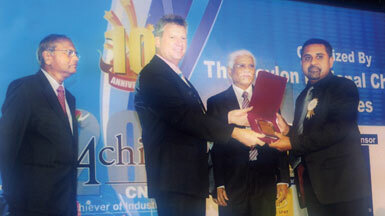 Central Industries PLC won Merit in the Extra Large Category at the Ceylon National Chamber of Industry hosted the 10th Achiever Awards at the Cinnamon Grand recently. Central Bank Governor, Ajith Nivard Cabraal was the chief guest. Here the Marketing Manager of Central Industries PLC Hemantha Arambepola receives the award from the CEO of Sri Lanka Telecom Greg Young. The immediate last chairman of CNCI, Newton Wickramasuriya and Past Chairman of CNCI A.K. Rathnaraja look on. 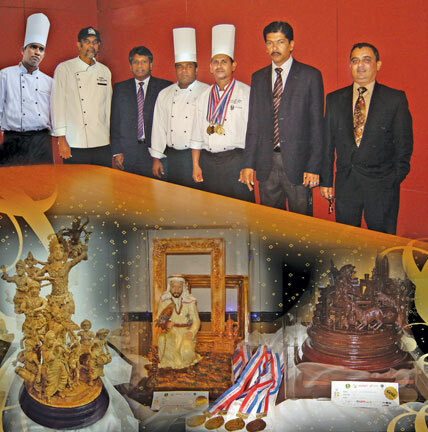 Ballys Colombo, won gold and bronze medals at the recently concluded Chefs Guild and Culinary art 2011 exhibition at the BMICH. Ballys Colombo caters to the tourism industry in Sri Lanka. Here the award winning culinary art chefs and the senior management team.